Prestigious Kyalami Park is one of South Africa's largest business parks covering a staggering 72 hectares (720 000 sq m) and playing home to some 250 companies and thousands of employees. The competitively priced, quality accommodation of the Park combined with its appealing environment attracts a variety of businesses. Its lush landscaped gardens, tranquil parklands, dams, paved walkways and excellent roads all add to its aesthetic appeal. The majestic views of Johannesburg and Kyalami Race Track from many of its sought-after properties simply reinforce its A-grade status. Conveniently located, Kyalami Park is positioned between Pretoria and Johannesburg city centres and the East and West Rand. It is easily accessible and offers ample parking for both tenants and visitors. With as many as 8 500 vehicles passing through the electronic booms at the Park entrance on an average work day, security is a top priority. The Park boasts a 24/7 manned control room, security cameras, armed guards and vehicle patrols. Kyalami Park is dedicated to maintaining a safe environment for owners, tenants and employees alike. 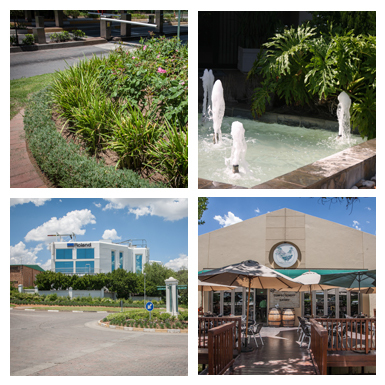 The Park offers easy access to a wide range of medical and shopping facilities with neighbouring Kyalami Downs Shopping Centre conveniently providing for every day requirements. A large number of fast food outlets and restaurants cater for lunches and after-hours meetings. • The first business park to be built in a secure enclosed area with access control. • The first business park to be run by a Park Owner's Association with elected trustees to manage the Park. • The first business park to have a written Memorandum and Articles which members are bound to. • The first business park with laid down architectural and landscaping guidelines. The structures initiated by the developers of the Park set a precedent in South Africa. Other business parks have followed suit using Kyalami Park’s unique methods. Available from the office of the Park Manager.